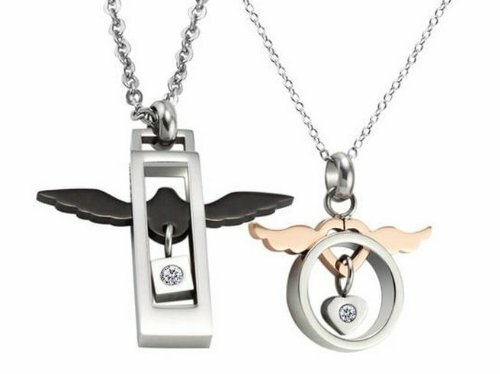 Aegean Jewelry Titanium Couple Pendant Necklace ''Endless Love to You'' Style with a Gift Box and a FREE Small Gift (One Pair) by Titanium Couple Necklace at Femi Store. Hurry! Limited time offer. Offer valid only while supplies last. What is titanium? Titanium is a natural element which has a silver-greyish-white color. Titanium is one of the hardest natural metals in the world. What is titanium? Titanium is a natural element which has a silver-greyish-white color. Titanium is one of the hardest natural metals in the world. It is stronger than steel and much stronger than gold, silver and platinum and yet is very light weight (45% lighter than steel). Polished titanium is very similar to platinum in lustre and appearance, and just needs to be repolished to retain its original shine. Why choose titanium? Titanium provides several unique factors that make it the ideal metal for jewelry. It is very strong, more dent, bend and scratch resistant than gold, silver and platinum, and is very lightweight. Titanium is also the only metal used in jewelry today that can be guaranteed not to produce skin irritation, our titanium is 100% hypoallergenic and will not produce skin irritation or discoloration. Is titanium hypoallergenic? Titanium is 100% hypoallergenic and allergy free and will not produce skin irritation or discoloration. Titanium does not react to sunlight, salt water, chlorine or anything that the body emits. This is why we only offer pure titanium to our clients. 30 DAYS MONEY BACK GUARANTEE, YOUR SATISFACTION IS THE TOP PRIORITY! If you have any questions about this product by Titanium Couple Necklace, contact us by completing and submitting the form below. If you are looking for a specif part number, please include it with your message.